March is National Nutrition Month and it marks the start of spring. This has everyone thinking about health, and making plans to revamp lifestyle and diet for the new season. As I started focusing on my personal lifestyle goals, I figured it would be a great time for a baseline blood test to start the season right. A few weeks ago I got my blood drawn, hoping to get a peek inside my body to see exactly what I was working with going into the warmer months. To be honest, I wasn’t expecting anything spectacular from my blood test results. I knew my diet had slipped over the winter, which was full of cozy nights watching Netflix with some of my favorite comfort foods and wine. However, I was still a bit shocked when I saw exactly how far certain markers had strayed from optimal, or even normal levels – specifically, my blood glucose and cholesterol markers! In hindsight, this makes complete sense. Traditional comfort foods are generally high in fat and sugar, and we tend to indulge a little more over the winter. When your body is given more glucose (sugar) than it needs, that excess glucose stimulates and feeds into fat synthesis, which affects your cholesterol levels. Seeing as how most of us likely indulged in simple carbs a bit too often over the colder months, blood glucose and cholesterol are probably what you need to take a look at, as the winter months give way to warmer weather. 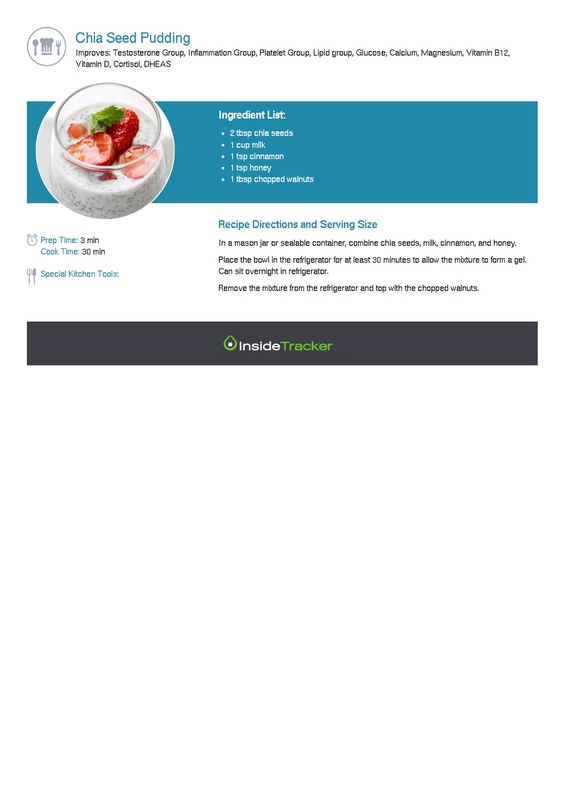 When you test with InsideTracker, you don’t just get food and lifestyle recommendations – you get ultra-personalized, specific recommendations for food, supplements, exercise and lifestyle based on your individual goals and biomarker levels. Each recommended food includes a recipe for how to incorporate it into daily life – so there are no excuses not to eat what’s good for you! We’ve recently expanded our database to include hundreds of additional foods with even more tasty, unique recipes targeting specific biomarkers. Here’s a preview of our 5 best recipes for improving metabolism (blood glucose and cholesterol) to get your body primed for the new spring season. Pair these meals with other dishes and snacks that are high in healthy fats and you can be back on track – or even more on track than you were before – in no time! 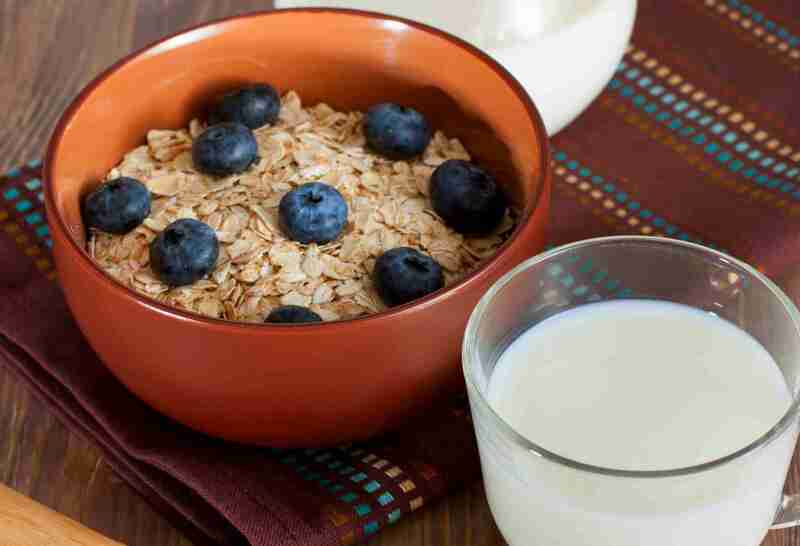 Oatmeal is a glucose-lowering champion! It is high in beta-glucan, which is a type of soluble fiber. Multiple studies have shown that consuming approximately 4 grams of soluble fiber per day can help lower blood glucose and cholesterol levels1,2,3. I love oatmeal for breakfast. It is so quick and easy to make, and can be very versatile as well. 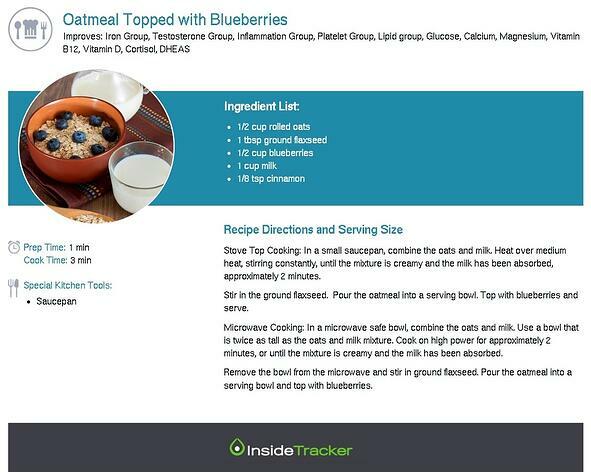 Our InsideTracker recipe for oatmeal topped with blueberries is a great start, but feel free to mix up your toppings! Try adding nuts, chia seeds, or different fruits and berries. The more, the berrier. 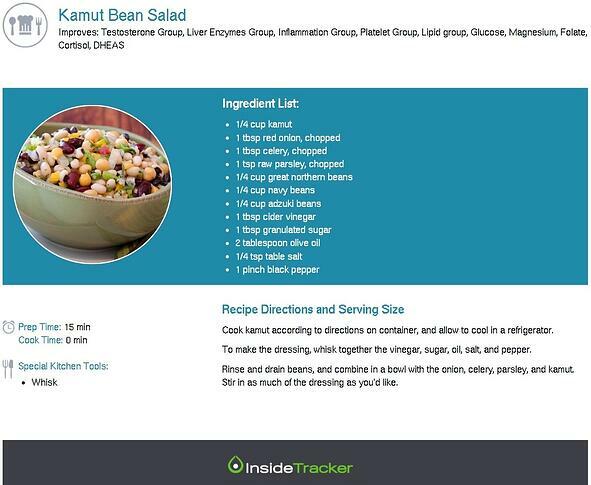 Kamut is a whole grain that, like oatmeal, is high in fiber, making it a healthy and filling lunch or side dish for dinner. Kamut bean bonus: they're also a great source of iron4. 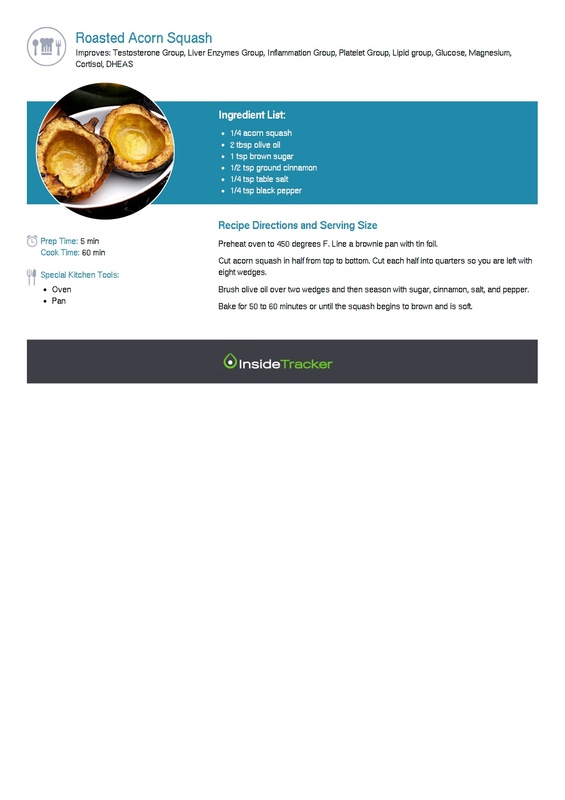 This roasted acorn squash makes a great vegetable side dish. To lower blood glucose and improve lipids, we recommend eating at least 4 servings of vegetables a day5,6,7 to increase fiber and to ensure you're getting in your vitamins and minerals. 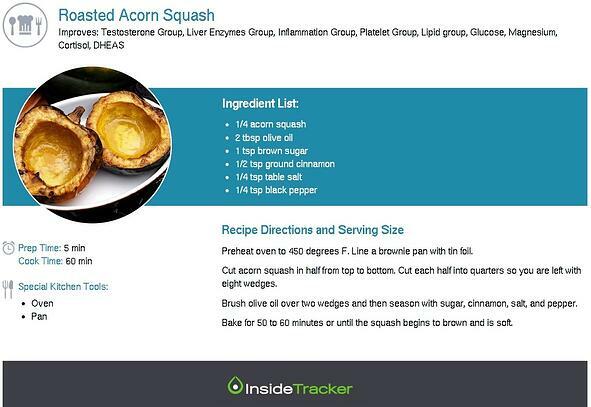 This roasted acorn squash has a creamy, savory flavor without any added fat or sugar. 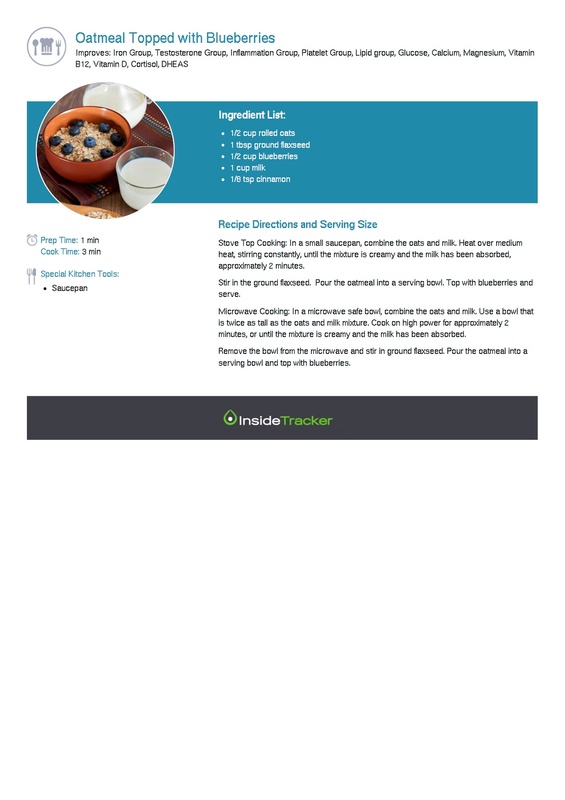 Try serving it with fish or lean meat and a whole grain to optimize its glucose and cholesterol lowering effects! 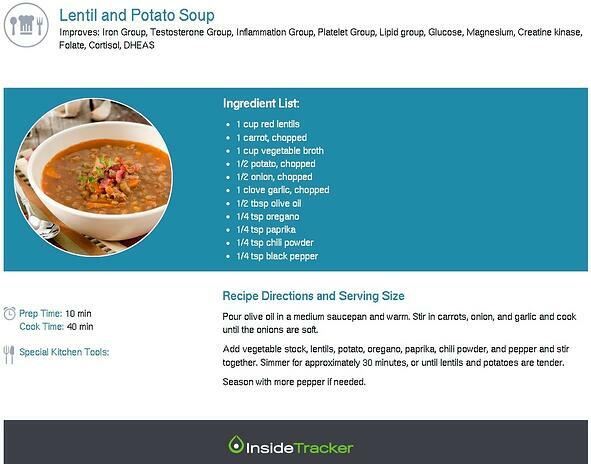 Lentils, like beans, are legumes that are high in fiber (do you see a pattern here?). 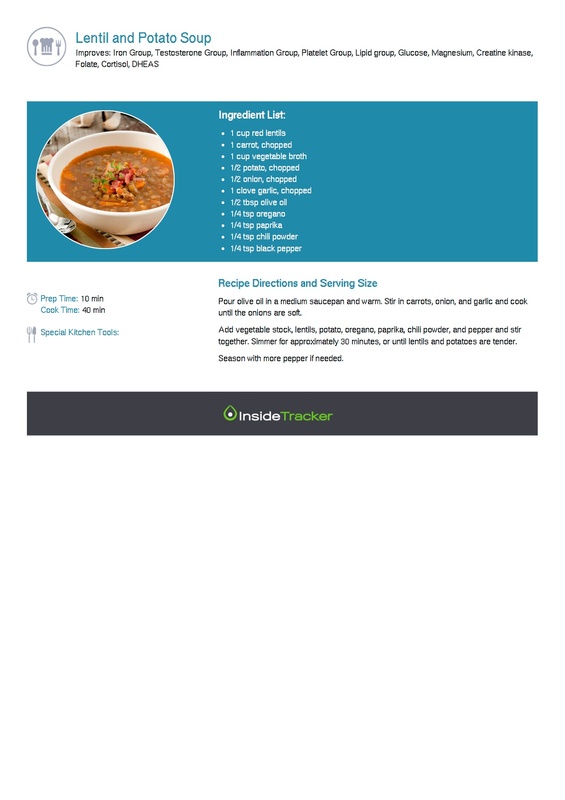 This hearty soup is guaranteed to satisfy your cravings for a warm, comforting dish during winter (ok, colder spring) weather, and makes a great main course for dinner. Serve a grain alongside it to make it a complete protein. Because no one wants to skimp on dessert, try this treat on for size. 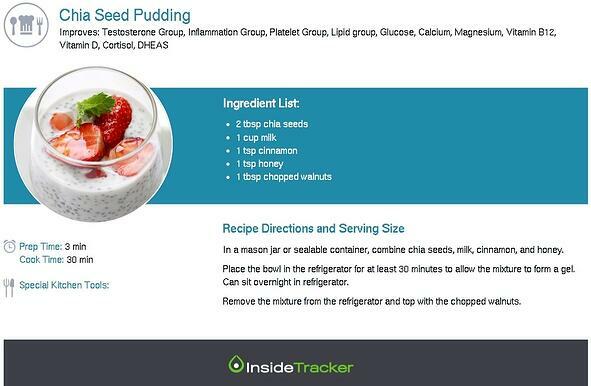 Chia seeds are very high in soluble fiber, which is what forms a gel “pudding” when you let them sit in milk. Because they are seeds, they’re also very high in healthy fats that can further help lower your cholesterol levels. In addition to helping to improve blood glucose and cholesterol levels, this delicious dessert can also can help fight inflammation in the body. Try topping with different types of fruits to mix it up! Hint: You may notice that all of these recipes have a big thing in common: Fiber! Give these high-fiber recipes a try this week; I know I will be. Foods rich in fiber help improve metabolism by slowing down the absorption of sugar (stops the sugar spike and crash) and by binding cholesterol. Be sure to supplement these meals with sources of healthy fat – like fish, nuts, seeds, and olive oil – and lean protein to optimize your metabolism this spring! Ho HV, Sievenpiper JL, Zurbau A, Mejia SB, Jovanovski E, Au-Yeung F, Jenkins AL, Vuksan V. “A systematic review and meta-analysis of randomized controlled trials of the effect of barley B-glucan on LDL-C, non-HDL-C and apoB for cardiovascular disease risk reduction.” Eur J Clin Nutr. 70.11(2016): 1239-1245. Schuster J, Benenca G, Vitorazzi R, Morelo Dal Bosco S. “Effects of oats on lipid profile, insulin resistance and weight loss.” Nutr Hosp. 32.5(2015): 2111-2116. Zhu X, Sun X, Wang M, Zhang C, Cao Y, Mo G, Liang J, Zhu S. “Quantitative assessment of the effects of beta-glucan consumption on serum lipid profile and glucose level in hypercholesterolemic subjects.” Nutr metab Cardiovasc Dis. 25.8(2015): 714-723. Mudryi AN, Yu N, Aukema HM. 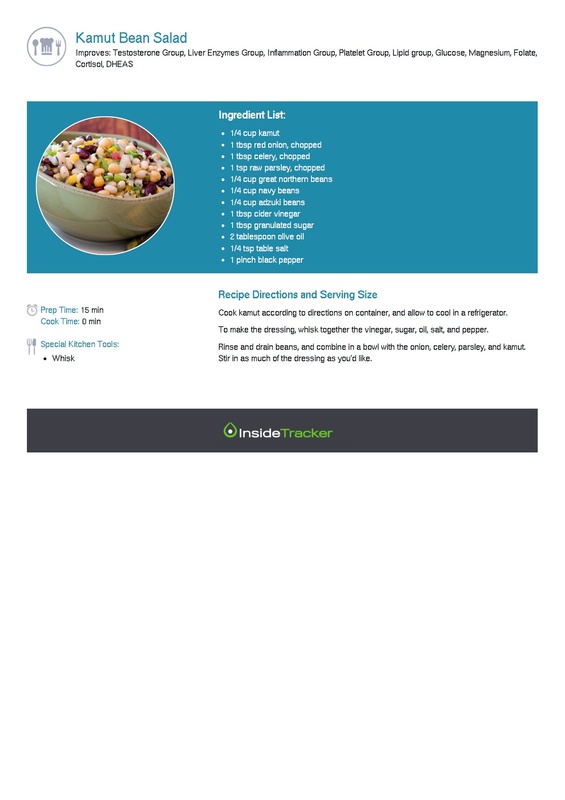 “Nutritional and health benefits of pulses.” Appl Physiol Nutr Metab. 39.11(2014): 1197-1204. Weickert MO, Pfeiffer AF. “Metabolic effects of dietary fiber consumption and prevention of diabetes.” J Nutr. 136.3(2008): 439-442. Dahl WJ, Stewart ML. “Position of the Academy of Nutrition and Dietetics: Health implications of dietary fiber.” J Acad Nutr Diet. 115.11(2015): 1861-1870. Delzenne NM, Cani OD. “A place for dietary fibre in the management of the metabolic syndrome.” Curr Opin Clin Nutr Metab Care. 8.6(2005): 636-640.